Life for many members of Washington’s diplomatic corps is, one imagines, pretty much a picnic. For example, the ambassador fromBarbados generally faces no career-threatening crises. Nor does the ambassador from Luxembourg. Others have trickier assignments. The ambassador from Yemen, Abdulwahab Abdulla al-Hajjri, can’t be having an easy time lately, especially since his brother-in-law is his country’s beleaguered and despised president. The ambassador from Bahrain, Houda Nonoo, is in the supremely odd position of being a Jewish woman representing a Sunni Muslim monarchy that oppresses a Shiite majority. The ambassador with the hardest job in Washington is undoubtedly Pakistan’s Husain Haqqani, a skilled and wily diplomat who faces the near-impossible task of representing a country that Washington considers at once a crucial ally and a treacherous adversary. A one-time Islamist turned pro-democracy Americaphile, Haqqani is seen by many in his own country as an American toady. But some of his critics, including many of Pakistan’s generals, benefit materially from Haqqani’s work as his country’s most effective interpreter and apologist. Haqqani’s entire tenure as ambassador has been an exercise in crisis management. But the crisis has become truly perilous since a U.S. Navy SEAL team found Osama bin Laden living quietly in a city not far from Pakistan’s capital and killed him May 2. Pakistan saw the raid as a gross violation of its sovereignty; the U.S. saw Bin Laden’s presence in Pakistan as, at the very least, proof of Pakistan’s unwillingness to fight terrorism. Since the raid, the countries have behaved like an about-to-be-divorced couple: The Pakistanis have been rolling up CIA networks, and the U.S. has suspended $800 million in military aid. I visited Haqqani recently at his embassy, which is across the street from the Israelis (of all people), to talk about the diverse impossibilities of his assignment. He didn’t completely disagree with me when I suggested that he has the worst job in the city. Haqqani faces a double-layered problem. Not only is his country viewed by many on Capitol Hillas an enemy state, but also Pakistanis at home have turned ferociously anti-American. So Haqqani spends as much time explaining America to Pakistan as he does explaining Pakistan to America. 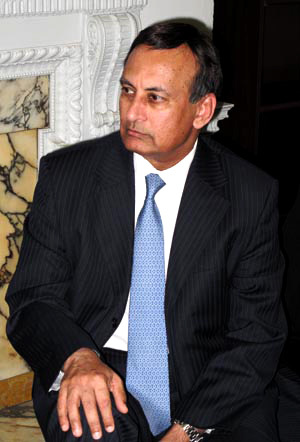 He recently visited his country’s National Defense University and asked a group of officers, “What is the principal national security threat to Pakistan?” A plurality named not India, or al-Qaeda, but the U.S.
Haqqani blames Pakistan’s democratic nature (he has taken to speaking as if the Pakistani military doesn’t have veto power over decisions made by the civilian government) for part of the country’s anti-U.S. turn. Whatever their reasons, it’s delusional for Pakistanis to think of the U.S. as an enemy. Although the U.S. has sometimes been a feckless partner, it is no more an enemy of Pakistan than it is of India. The U.S. spends billions of dollars on civilian and military aid to Pakistan (much of it negotiated by Haqqani), and Washington would very much like to trust in Pakistan’s friendship. The American street, however, is deeply frustrated. One doesn’t have to believe that top Pakistani officials knew of Bin Laden’s Abbotabad hideaway — I don’t — to view Pakistan’s support for the militants killing Americans in Afghanistan as the action of a hostile state. And so Haqqani spends most of his time patching the relationship, especially on Capitol Hill. His work was made particularly difficult last week, when accusations surfaced that Pakistan’s intelligence agency, the ISI, was secretly funneling money to U.S. political candidates to sway them to Pakistan’s side. “Out of 11 congressional offices I visited, five put the newspaper with that story in front of me. I’m trying to come and talk about the big picture issues,” he said. It is because the Obama administration, and Congress, like Haqqani more than they like other Pakistani officials that he can be as effective as he is. Perhaps his finest moment came during the case of Raymond Davis, the bungling CIA contractor accused of fatally shooting two people on a street in Lahore. The U.S. claimed Davis possessed diplomatic immunity; the Pakistanis disagreed. The case was turning into the biggest crisis between Pakistan and the U.S. in years when Haqqani helped engineer an elegant solution: He turned to sharia, Muslim law, which allowed the dead men’s families to be compensated with blood money. This is the ploy that sprang Davis from jail. But the Davis matter pales in comparison to today’s tensions. Pakistan and the U.S. are near the point of breakup, with devastating consequences for the fight against al-Qaeda and the Taliban. Hillary Clinton, who was visiting India last week, essentially designated Pakistan’s traditional adversary as a strategic partner. There’s only so much a single ambassador can do. What’s most noticeable today in the relationship between the U.S. and Pakistan is the fatigue caused by the comprehensive dysfunctions between them. Haqqani sees this fatigue wherever he goes.